AMC is no longer aggressively promoting the Eagle and the sales slide begins. There will be few changes to the cars until production ceases. 1985 AMC Eagle Wagon. Wagon sales dip to 13,353 units. (Owner member: Eagle1985). 1985 AMC Eagle Wagon. (Owner member: Eagle1985). 1985 AMC Eagle Wagon front interior. (Owner member: Eagle1985). 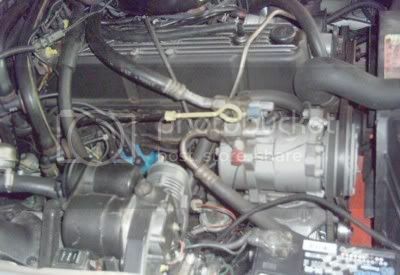 1985 AMC Eagle 258/L6 engine, with Factory A/C and equipped with automatic load leveling with an onboard air compressor for the rear shocks. 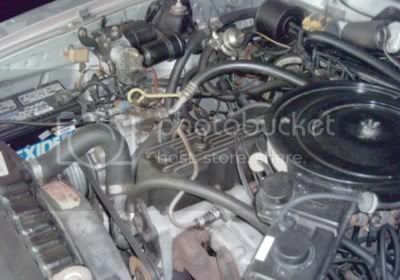 Engine shown has an after market Aluminnum valve cover which replaced the leak prone synthetic factory cover. (Owner member: Eagle1985). 1985 AMC Eagle Wagon got the power-bulge hood previously used only on the AMC Eagle SX/4 and the AMC Eagle Sport as its final restyling. A total of 2,665 four door sedans were produced this year.